Do Magnetic Water Conditioner limescale removers work? For a start their name is a little misleading because they do not remove limescale, they supposedly prevent it from forming. In theory they do work. The science behind them is sound. I think the only real issue is the fact that a lot of the magnets are not powerful enough for the job. These ones I recently purchased seem quite powerful, and I have high(ish) hopes. I attached two magnets to the main water inlet, and one to the inlet pipe of the electric shower, and another one to the inlet pipe of the washing machine. It will be a couple of months before I can tell if they have made any real difference, but for a few £££ It’s worth a try. Fingers crossed. This entry was posted in House Renovations. on September 29, 2013 by Richard. 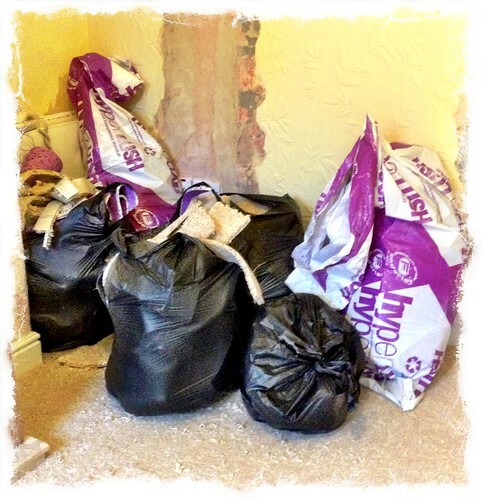 Over the last few weeks we have been filling up the backyard with general rubbish, rubble, carpets, lino, kitchen units, and various other things as we’ve steadily sorted out the house. The idea was to pay Durham Council to take away all of the rubbish, but I changed my mind once I looked at the cost. It costs £25 per six items/black bags. I worked out it would have cost about £200 to clear the backyard. That’s a hell of a lot of beer money. So, after a great deal of thought (about 2 seconds) I decided to support the British Real Ale industry instead of Durham County Council. 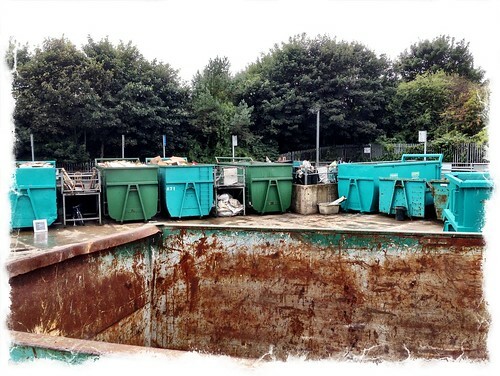 The council already takes £1,500 a year from me, so I thought why not make use of their ‘free’ recycling centres. After all, I’m paying for them. It took 3 full loads in our estate car to clear the yard of the assorted rubbish we’ve amassed during the house renovations. 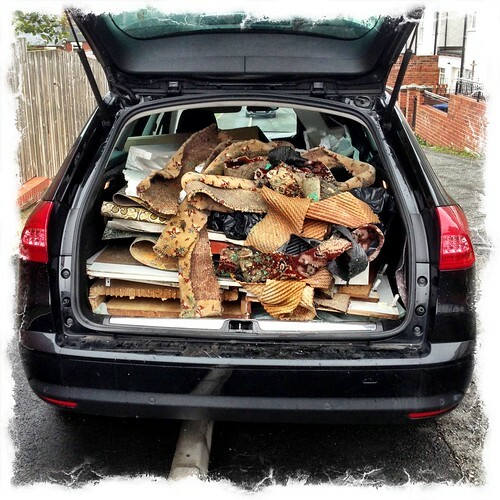 It was good exercise for me, putting the rubbish in to heavy duty rubble sacks, loading the car, and then driving 5 minutes up the road to the recycling centre, where I unloaded everything. 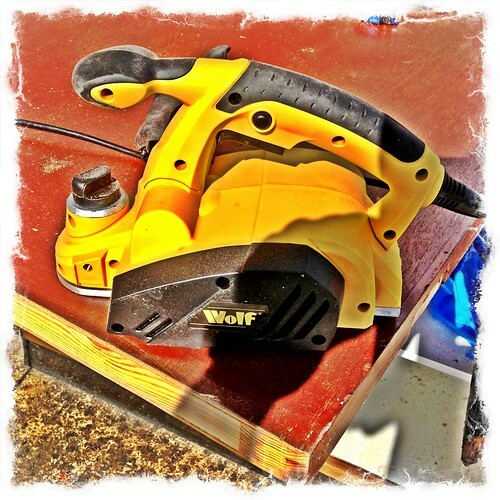 This entry was posted in House Renovations. and tagged Recycling on September 14, 2013 by Richard. Carpet and Vinyl Flooring in da House, True that! 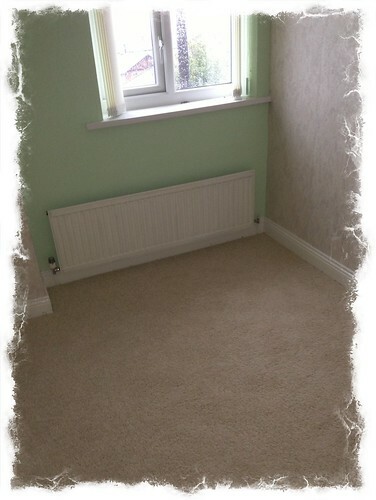 After 5 weeks of being in our new house in Easington Colliery, we now have new carpet, and vinyl flooring laid. 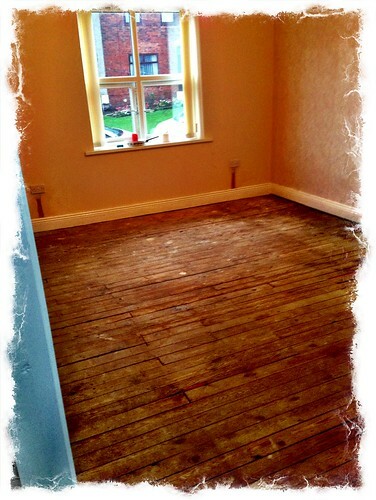 We had ordered it a few weeks previously from Global Flooring (Seaside Lane, Easington Colliery, Peterlee, County Durham, SR8 3LA) but first we needed to have the house rewired. 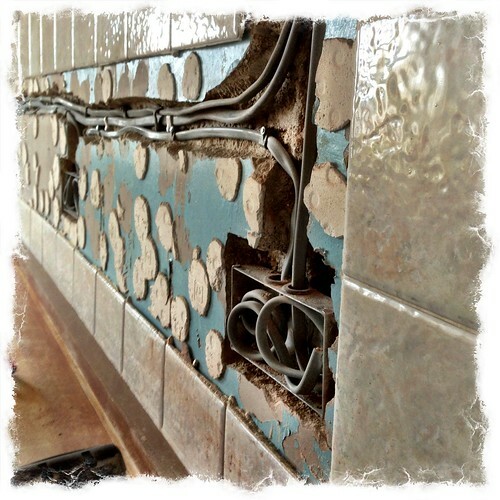 As often happens with house renovation, one thing lead to another so we ended up living with the bare concrete on the ground floor, and on the first floor the house was not looking good and neither were the floor boards which were in very poor condition. They were badly laid, and very creaky. The carpet fitters arrived just before 9am, on a very wet and windy day. At first there were 2 of them, then 4, and finally 6. The house was a hive of activity. They were like a whirling dervish, seriously cracking on with their work. 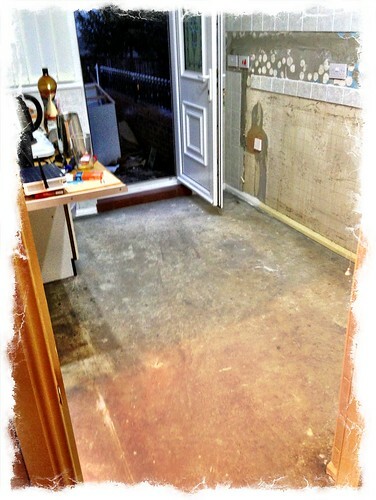 Just two hours later the carpet and vinyl flooring was down, and the fitters headed off to their next job. We have never been fans of carpet, and we’ve never bought it before. In our previous homes we’ve stripped floorboards and varnished them (our London home) or had ceramic floor tiles (South of France home), but as we’re now living in the cold North of England carpet seemed the obvious choice. 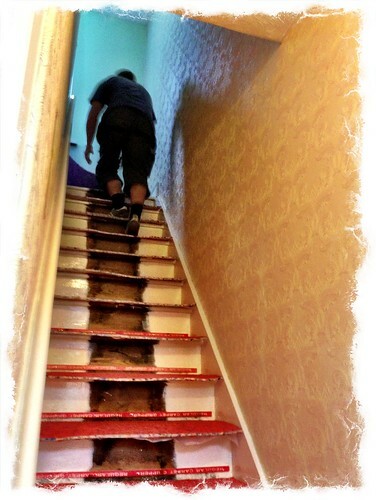 It’s only been a couple of days but I think we’re now carpet converts. 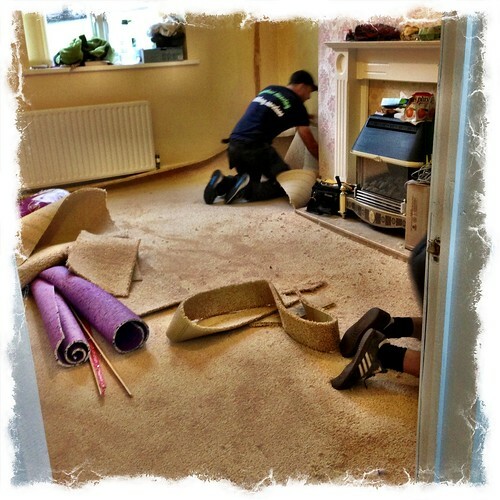 The 12mm underlay and super-thick soft carpet have definitely changed our opinion. 🙂 We love it! This entry was posted in Easington Colliery, House Renovations. and tagged Carpet, Underlay on September 8, 2013 by Richard. The guy from Northumbrian Water (our water supplier) arrived this morning to install a water meter in our house in Easington Colliery. I had an idea that this would be a time consuming exercise, but it took all of 5 minutes. The meter was installed on the stopcock by the back gate. It was almost an anticlimax, it was over so quick. 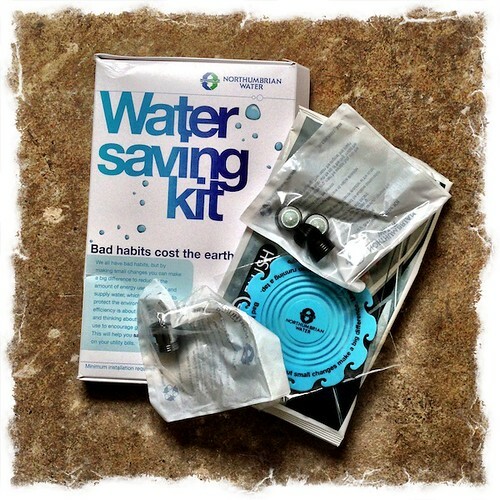 Ironically, or maybe just by fate, a Water saving kit also arrived in the post from Northumbrian Water at about the same time as the guy fitting our new meter. It contains lots of ‘bits and bobs’ to reduce water usage and wastage. I’ve alway thought it odd, that in the U.K. older properties often do not have water meters, and pay a flat feee each year. When we lived in Central London, many many years ago this was a very high fee, and I’m sure it’s even higher now. 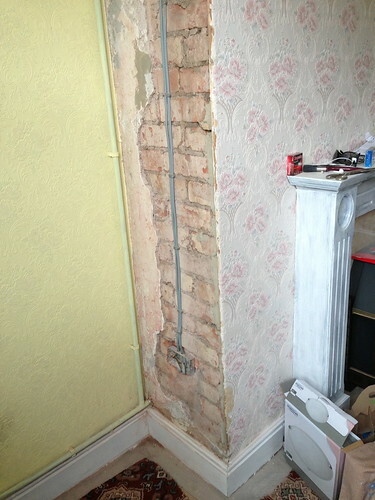 To add insult to injury Thames Water even wanted to charge an exorbitant fee to install a water meter in our property. Imagine paying a flat fee for your usage of gas and electricity. We would all have every single one of our lights on all of the time, and the gas central heating would be on pull blast too, whatever the weather. This entry was posted in House Renovations. 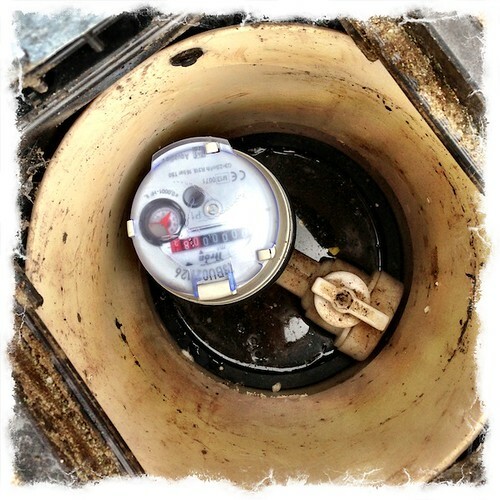 and tagged water, Water meter, water metre on August 24, 2013 by Richard. 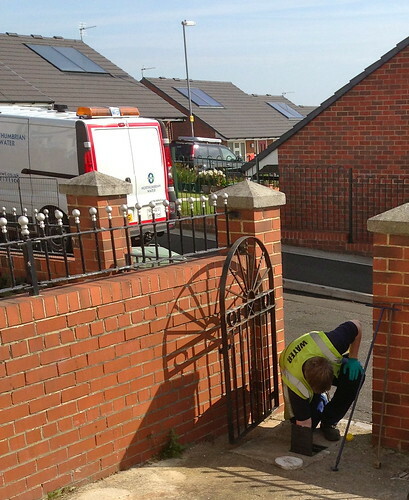 There are many big jobs to do in the renovation of our house in Easington Colliery, most of which we are getting professionals in to do, but that does not mean that there are not a million small jobs to do. There is a small amount of repointing needed on the front exterior of the house and it also needs waterproofing, and the plaster work inside the house needs a coat of PVA. Then there are a few holes that need filling, and various other bits and bobs that need doing. For all of these small jobs I needed a few supplies, so I headed to the Wickes store in Stockton On Tees (PORTRACK LANE, STOCKTON ON TEES, CLEVELAND, TS18 2RB). I had never visited that branch of Wickes before, so I was forever asking the staff where to find the items I needed. Luckily the staff were professional and very helpful and I soon found all of the stuff I needed. I came away with the instruments of my torture, but at least shopping for them was not torture, well, not until I had to pay for them. This entry was posted in House Renovations. 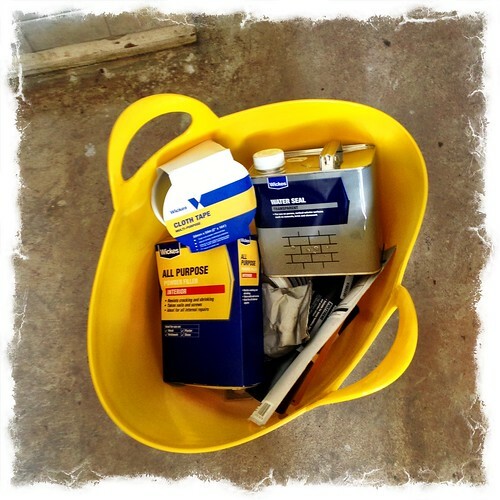 and tagged D.I.Y., House Renovation, Renovation, Wickes on August 22, 2013 by Richard. 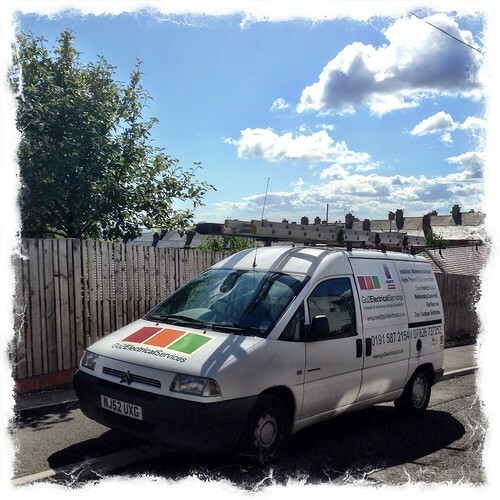 The house we recently purchased in Easington Colliery needed a complete rewire, so a few days after moving-in we had several electricians round to give us quotes on the work required. All of the quotes were roughy the same. 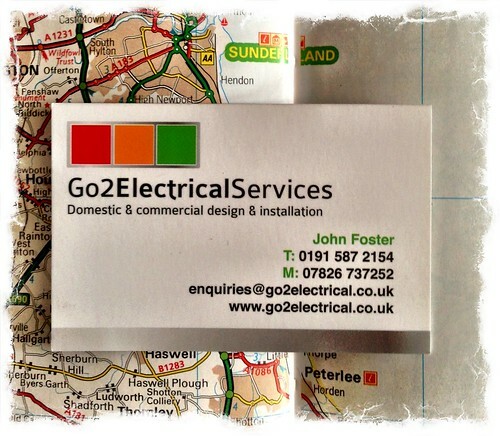 We decided to go with Go2 Electrical Services Ltd (Peterlee, Tel: 01915872154 www.go2electrical.co.uk). We’d checked their credentials, they are Napit registered. 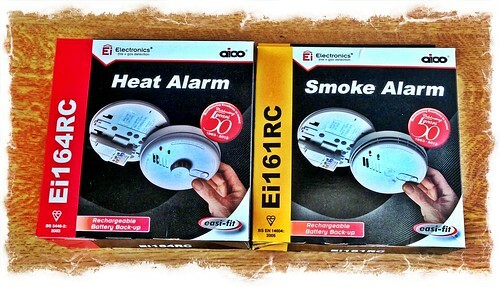 We chose Go2 Electrical Services for two reasons. 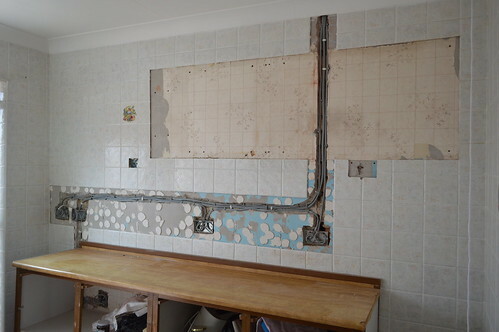 Firstly, they had been recommended by a guy at Global Flooring in Easington Colliery, and usually a verbal recommendation works out well, and secondly they could start the rewire sooner than the other electricians we’d received quotes from. The electricians from Go2 Electrical Services, John and Dave, arrived on a Tuesday morning, and got straight to it, they did not mess about. It was work non-stop from 9.30am to 6pm, with only a short break for lunch. First off they cut the chases, and the house filled with dust. 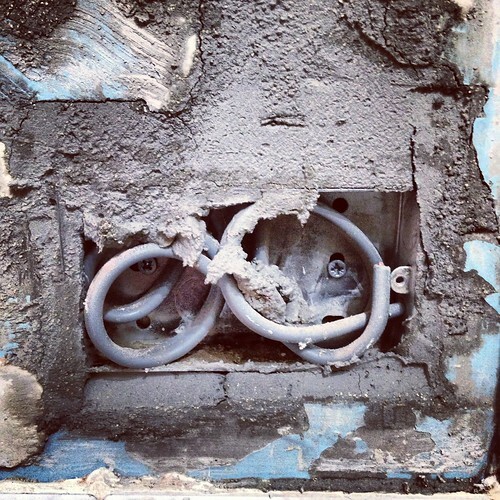 The ground floor of the house has concrete floors, which meant the chases for the sockets are very long. 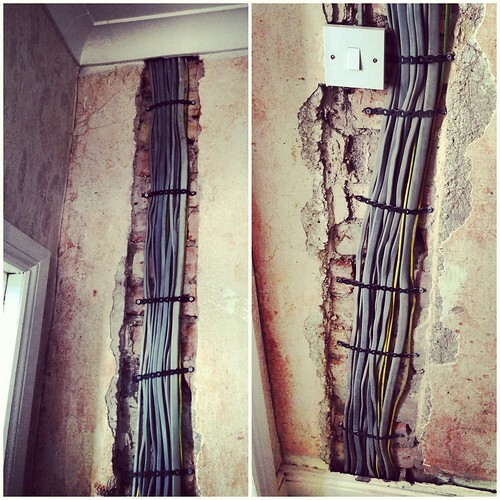 The wires run under the upstairs floor and right down the length of the ground floor walls. Not a pretty sight. Before work commenced the living room walls didn’t look particularly bad, well, apart from the fact that each wall had a different patterned wallpaper, and we do not like wallpaper of any sort. 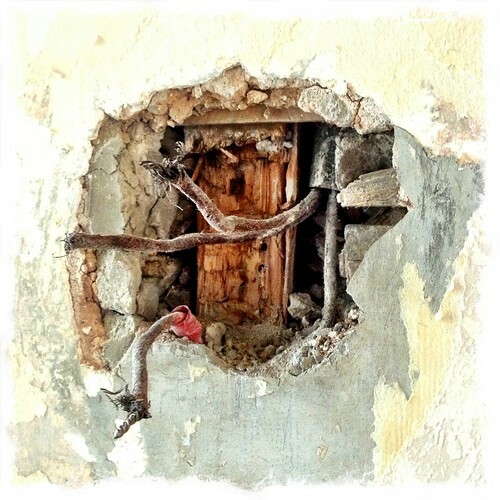 But once the electricians got to work, the walls of the living room soon resembled open wounds. 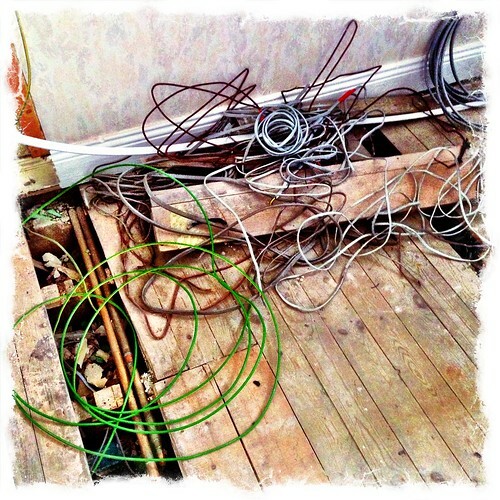 So, not long after John and Dave started to rewire the house it quickly changed its appearance. As the hours slipped by the dust settled in ever increasing thickness, on every surface. Luckily we did not have much in the way of furniture or possessions, so a couple of old sheets were all that we needed to cover our meagre chattels. John and Dave arrived early every day, only stopped briefly for lunch, and stayed until each stage of the rewire was done every evening. At the end of every working day, John and Dave spent time clearing away any rubbish, and sweeping up the evidence of their presence. We told them not to bother, as quite frankly the house was a building site, and resembled a derelict squat, but ever the professionals they insisted on leaving it as neat and tidy as they possibly could. It wasn’t just the rewiring, we also needed an electric shower fitted. Dave had arranged for a bloke to do the job, and Thursday saw the plumber arrive to fit the new electric shower. The house was going from destruction to construction. John and Dave kept up the pace, and we could see the end in sight. 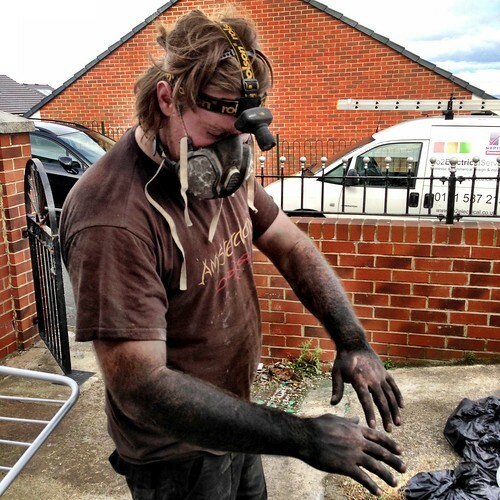 It also saw Dave climbing into the loft to run wires, and returning covered head-to-toe in soot. A very dirty job but someone had to do it. Friday was a much cleaner day, and a quieter day. John and Dave had organised a plasterer for us. 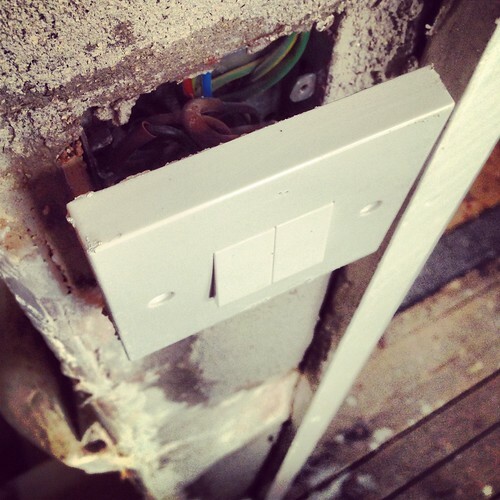 Over the weekend the plasterer came to fill in the chases, tidy the wall sockets, and any little holes. 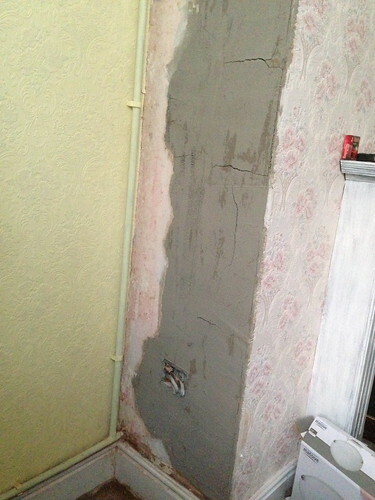 On Saturday, the plasterer did the bonding, and then he came again on Sunday for a skim of finishing plaster. It was nice to see the walls returning to some sense of normal, no more gaping gashes. 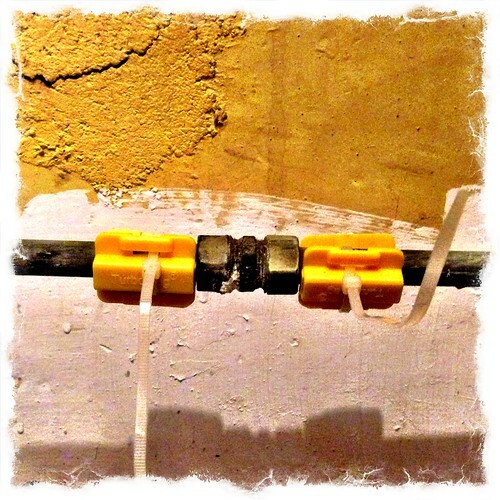 On Monday morning the electricians, John and Dave returned to do the second fix. Before they started their work, they had a look at the plasterers work. They agreed with us that it wasn’t as good as it could be. 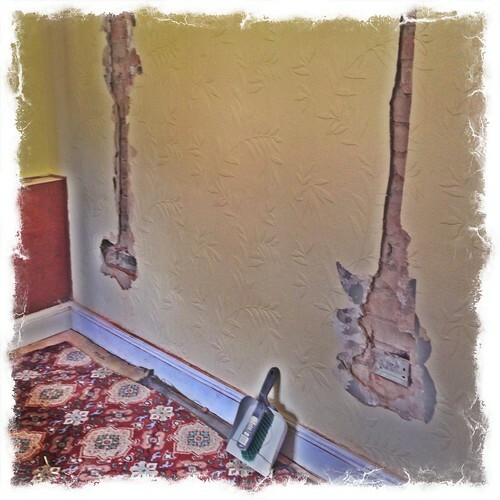 A quick phone-call was made to get the plasterer back to make good. John and Dave then commenced the second fix, connecting the plug sockets, and testing the circuits. And that was it, their job was complete. 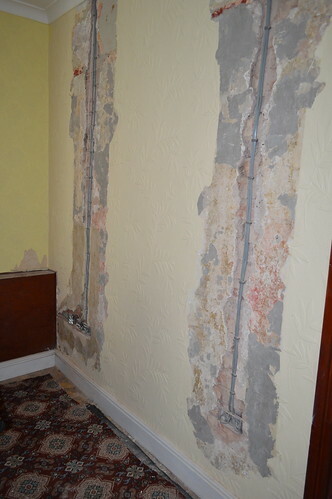 The plasterer returned on Monday evening to re-skim the areas that required it. This time he did a much better job. Phase one of the house renovation was over. In just a five days the house had gone from almost no electricity to fully connected. It was emerging in to the 21st century. There was just one single electric wall socket in the entire upstairs of the house. 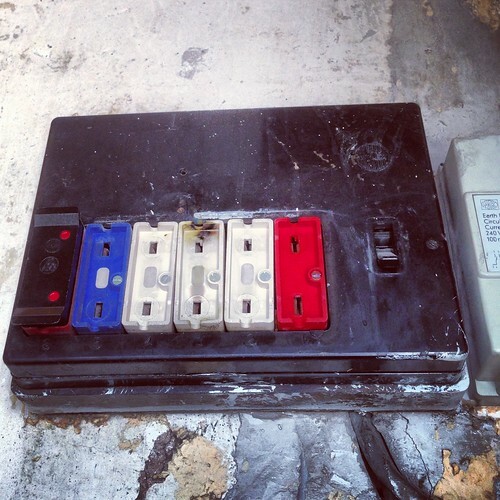 One socket which probably didn’t even work, although we never tied to use it because it was so old it was Bakelite. Now there are plenty of double wall sockets in all of the rooms, and new light fittings, and light switches, and smoke alarms, and a heat detector. 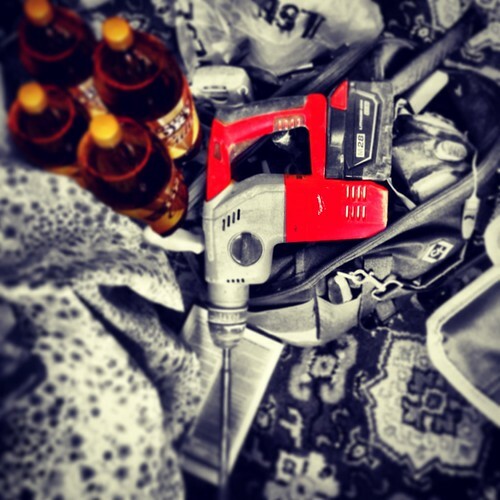 Everything we need for modern day living. It had been a busy, dusty, tiring few days, but we now had the house back to ourselves. 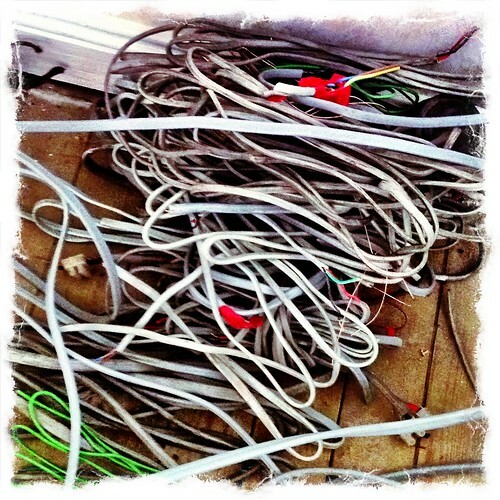 It was good to have the rewiring completed, but we’d actually enjoyed having the electricians here. John and Dave are not only professional, good workers, but we also had some good chats about the things we have in common – mainly beer. Haha! We have yet to use the homegrown garlic that John kindly brought us from his allotment. 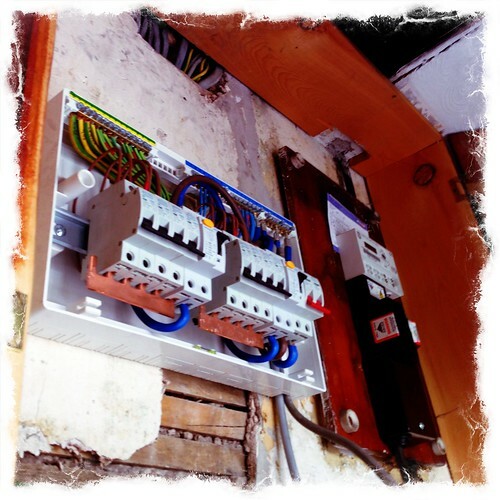 We recommend Go2 Electrical Services for any electric work. This entry was posted in Easington Colliery, House Renovations. 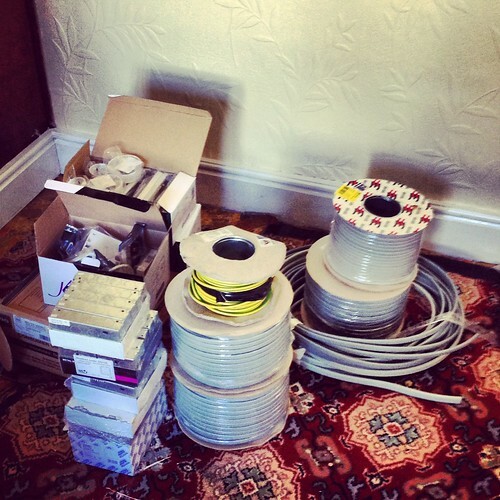 and tagged House Renovation, House Rewiring, Rewiring on August 20, 2013 by Richard. 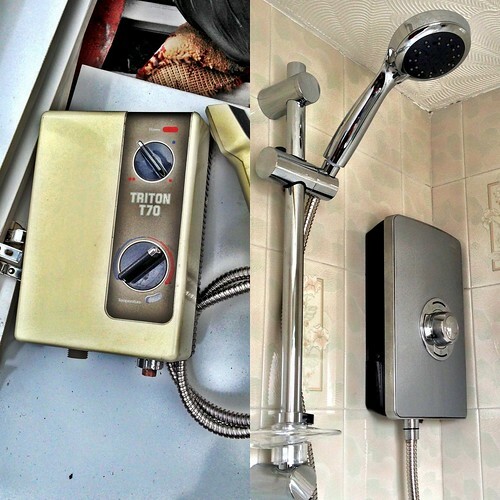 The old Triton shower that was in the house when we purchased it, has now been replaced with a shiny new Triton Electric Shower. We are both looking forward to a proper hot shower tonight, which will be the first one in our new home. It will really good to thoroughly wash off all of the builders dust. We haven’t been complete soap-dodgers since we took possession of the house, we’ve been having showers poor-man style – with a jug in the bath. As good company as they are we can’t wait for the electricians to finish work for the day, and leave us so that we can get naked and clean. We would strip off now, but we don’t want to put them off of their food. 😮 Roll on tonight. I ordered the shower from http://www.showerdoc.com/ because it was the best price I could find online. Delivery was very speedy. 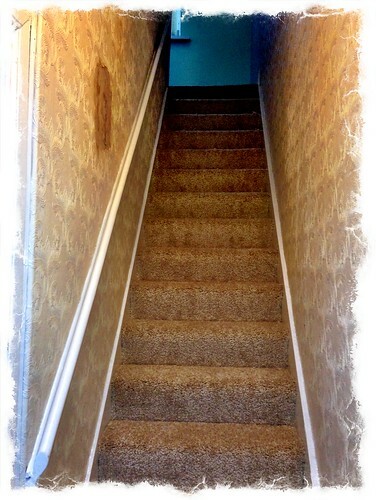 This entry was posted in House Renovations. on August 16, 2013 by Richard.